The new logo is the result of a multi-step design process used by VOID to bring a design project from concept to fruition (more on that below, if you’re the type who is interested in that sort of thing). We’re very happy with the results, as the new logo is a strong brand that can be used across multiple platforms, from web to print to merchandise. Creating a new logo in the modern era is hard, because it has to be something that looks good when screen printed on a T-shirt a foot wide, all the way down to something that people can see on their smart phone display, 100 pixels high or less. VOID aced it. We have three versions of the logo: the main Tech Sideline logo, an enhanced circular version of the logo, and a special Lane Stadium version of the logo, all designed by VOID. Click each for a larger version. The new main Tech Sideline logo is now in use across all of our platforms: here on the site (desktop, tablet and smart phone), on our Facebook page, and on our Twitter page. 1.) We will be launching a Tech Sideline store — the plan is tomorrow, December 10th — featuring the new logo on everything from T-shirts to golf/polo shirts to outerwear to a hat … including something you original Hokie Central members from back in the ’90s will like: the ability to personalize (i.e., have your message board username embroidered on) a golf shirt, with text stitched on the sleeve. So warm up your credit cards and think about Christmas gifts! 2.) Please see the VOID company description at the bottom of this article for more information about VOID Design Haus. 3.) If you’re interested in learning more about how the new logo came about … keep reading. We decided last summer that TSL needed to freshen up our image, and the best place to start is with a new logo. Having interviewed Kevin Jones in the summer of 2014, and having learned more about his education and his high level of interest in design (his Instagram account — iam_kevinjones — has numerous pictures of designs he finds interesting, from shoe designs to buildings to furniture to a fire hydrant in Switzerland), I knew he could help. So I reached out to him and asked him to help me write an RFP — Request For Proposal — describing our need for a new logo, in terminology and language that designers would understand. I could then take the RFP and pass it around to potential designers, and award the job to the one who had the best bid on the job. That email exchange led to multiple meetings with KJ and his VOID business partner Alex Barrette. Because Kevin works for the Virginia Tech Athletic Department, we had to work around his VTAD responsibilities and schedule, so our meetings were at night and occasionally on the weekend. Fortunately, we got started in the summer, before football season kicked in. We started with an open discussion about all aspects of TechSideline.com: our history, image, past, present, accomplishments, goals, and vision for the future. We talked a lot about what TechSideline.com is — and we’re a lot of things, good and bad, because we’ve been around almost 20 years now — and what we want to be. From those concepts, KJ and Alex first showed me dozens of existing corporate logos, some you’ve seen many times, and others you’ve never seen, to get an idea of what appealed to me. From there, they created a myriad of designs for a new set of TSL logos and designs. At one point, one of the designs they created was the word TECH in bold, simple letters, with the word SIDELINE in smaller letters on top. There were other elements to that design, but I remember the two words most of all. That jumped out at me right away. I loved the boldness of the word TECH, and I knew that if you shrunk a logo like that down to 60 pixels high, you’d still see the word TECH, and if it was orange and maroon, it would draw any Hokie fan’s eye. I asked them to put the word SIDELINE underneath the word TECH and work with that, and from there, they added the graphical sideline elements, with the hash marks for yard marks. That was a brilliant, simple enhancement to what was already a strong concept. That TECH SIDELINE logo became the building block for a trio of designs, shown above. I originally thought that the circular version would be our main logo, because circular logos are ubiquitous on the Internet, and their proportions work well for avatars, profile pics, etc. But the more I looked at the circular logo, and the more I realized that certain elements of it would disappear when it was shrunk down in size, the more I was drawn to the concept of the simple TECH SIDELINE logo as our main logo, and the basis for everything else. Early versions of these logos had additional elements to them, but the further we got along the path, the more we simplified things, taking out some concepts that were meaningful, but which added too much detail to the logos. Eventually, we wound up with what you see here, and we couldn’t be happier. You’ll note that the new logo (1) doesn’t brand us as a dot-com, and (2) doesn’t brand “TSL” like our old one did. Until now, I have insisted that our logo include “TechSideline.com” in it, and that all references to Tech Sideline refer to us as a dot-com. But if you look around, insistence on dot-com branding has gone by the wayside. VTScoop.com (247Sports) brands themselves graphically as VT Scoop. GobblerCountry.com (SBNation) brands themselves graphically as Gobbler Country. TheKeyPlay.com (independent) brands themselves as The Key Play. None of those sites have dot-com in their logos. Only HokieHaven.com (Rivals) has dot-com in their logo, but much like us, their logo was created a loooong time ago. So we ditched the dot-com insistence, and the new logo is the better for it. As for branding the “TSL”, that has been a part of our logo for the last 15 years, but we just felt it was time to move on from branding the TLA (Three-Letter Acronym). The design process was interesting and fun, and working with Kevin and Alex at VOID resulted in a much better design than we could have generated on our own. In the end, a great logo is one you look at and think, “Of course that’s your logo. That’s exactly what it should look like.” And that’s how we feel about the designs produced by VOID Design Haus. After nearly 20 years, we finally have the logo we should have had all along. Coming tomorrow: Tech Sideline merchandise, featuring the new logos. VOID Design Haus (VOID) is a Blacksburg, Virginia based multidisciplinary design firm, committed to transforming conceptual narratives into novel experiences. 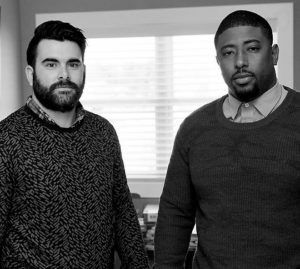 VOID was founded by former NFL running back Kevin Jones and business partner Alex Barrette. Kevin, having returned to Virginia Tech after seven years in the NFL to earn a degree in Industrial Design, met classmate Alex Barrette and the two spent the next three years working on a myriad of projects. Both Kevin and Alex spent time between school to work for companies like USM Switzerland, Scott Sports, New Balance, and Donald L. Blount and Associates, a Yacht Design Firm. The two teamed up to work on a thesis for USM Switzerland, and VOID Design Haus was born. VOID provides strategic design services to start-up and established companies to create and execute design solutions for problems of form, usability, physical ergonomics, marketing, brand innovation and sales. Through this practice VOID’s design team incorporates Value, Optimization, Innovation, and Design principles to design new and invigorating products that enhance user experiences and challenge traditional methods. VOID is a national and international award winning firm (2015 AIA-DC RE-Form Design award winner, 2015 Spark Design Award finalist). Visit VOIDDesignHaus.com to learn more, and you can reach VOID by emailing them at [email protected]. It’s great! Really eye catching and well conceived. Main logo … good job. I think that too many versions confuse. Not sure why they are needed. Only issue: The ‘C’ seems closer (right side) than any of the other letters. Will, EXCELLENT work and great choice on the main logo. I LOVE it just as it is. Simple, identifiable and pleasing to the eye. I was actually thinking that the single long hashmark in the middle was a stroke of genius. It draws the eye to the center of the logo (always a good thing) and gets the “sideline” point across in a more subtle manner vs. jabbing it at you. Brilliant! KJ and Alex did us right. And you are to be commended for giving a Hokie startup a chance to prove themselves. Keep it in the family!! VT hit a home run with Kevin Jones. The new logo is great. Love it! My one critique is that it should have two more of the long yardage markers, one on each end. The single long yard marker looks lonely there in the middle all by itself. I think it’s to create a T as in Tech. I like it in that light. I hadn’t noticed the T until you mentioned it. Nice touch! The stadium logo is choice. Merchandise that bad boy. Nice logo and interesting story. I must say, however, that the VOID name is very odd since it suggests that something is missing. I wouldn’t think that would be a helpful connotation. Glad to see where my lifetime subscription money is being spent well 😉 Great job VOID! The new logos are brilliantly conceived and executed, bravo! VOID will win some awards with this one. You both liked it back in the day, but it never went anywhere; it’s free too! Just make sure you don’t change it too much, or this website will erupt with concern. I like it, and still have the maroon jacket from Hokie Central days, with my user name on it….old timer, yep. I still have my shirt. I like the new design. That is really sharp. Stud RB and cool designer. Very nice! FYI, the Instagram links aren’t working for me. What do the 9 white stripes represent? Do they have something to do with the 8 pylons? Those are just yardline markers to evoke the sideline. Every five yards the marker is bigger. I thought of football laces as well as the sideline markers. Cheers to KJ. Glad to hear he is doing well. One of my favorite Hokies. Logo looks fantastic. I think it’s Great. Plus, anything KJ does, I’m good with it. Needs more orange! Just kidding. Love that KJ was involved. Love the yard markers. Iffy on the font, but that’s a personal preference. Nice job! if there is a negative, it would be the font selection. Great concept. As someone who does Website and Graphic design for a living. Very Nice. Looks great, and I’m really excited to see that Kevin Jones was so prominently involved. It’s great to see former Tech players and alumni doing well. Those are very well done! Congrats on the new look! I love how everything related to VT is getting a modern facelift! T-shirt, okay…but that last would good on ’47 brand low profile vintage cap! It looks fantastic. Awesome work by all involved.